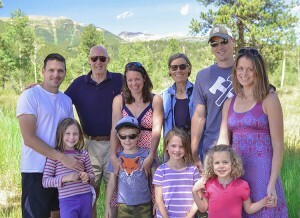 When Adventure Unlimited launched its Bridges to the Future Campaign so that future generations of Christian Scientists could have life-changing experiences through its programs, Hank and Wendy Paulson and their family made a strong statement of support. In the following interview with Wendy, she shares what the A/U Ranches have meant to them and why they pledged a $2 million Matching Challenge Grant. How has your involvement with Adventure Unlimited over the years affected your family? Adventure Unlimited has touched all of us in different ways. Hank was a bunkhouse counselor and member of senior staff when he was in college. He recalls that the responsibilities and growth involved prepared him better for later career positions than anything else he did. On an early résumé, he listed “Campfire talks on manhood” as one of the achievements he was most proud of and which he felt qualified him for the post being sought. He experienced and witnessed many healings during his time at camp and felt that it was the time he made Christian Science his own. Both our children also served as counselors, one as a program head. They felt then, and still feel, that they developed competence, confidence and the ability to work with others in new, spiritually impelled ways. The camps have a deep spot in their hearts. Of the four of us, I had the least early experience with [the A/U Ranches]. My first time there was at Family Camp the summer both kids were finishing up their summer work. Even though by the end of the week I felt I had been in training to be a stuntman (! ), I was enthusiastic about the experience and soon after was invited to join the board. I learned a lot from the years on the board, made some wonderful friends and witnessed significant growth in the programs and leadership. More recently we have experienced three consecutive summers of Family Camp with three generations. Each one has been a winner. What inspired you to pledge a $2 million Matching Challenge Grant to the Bridges to the Future Campaign? We have contributed consistently to the camps over the years, in appreciation for what they have done for our family members but, even more, for what they offer the wider Christian Science family. We give where we see strong leadership and effective programs. We’ve watched in recent years as strong, talented leaders improved programs and facilities, all the while maintaining a steady, practical spiritual focus. So it was not difficult to decide to make this commitment. You are generous friends of the organization and you participate in its programs, such as Family Camp. Why do you stay connected with Adventure Unlimited in these ways? We feel that Adventure Unlimited offers a unique opportunity – and support – for campers and staff of all ages to apply Christian Science in meaningful, practical ways. It may be overcoming a perceived inability to scale a mountain, or erasing a fear of horseback riding, or learning to appreciate the camper in the second bunk. Every day there is fresh opportunity for, and promise of, growth – in character, in humility, in understanding of God and one’s spiritual selfhood. Cap and Marianne Andrews had an extraordinary vision that they developed and nurtured, and it’s a privilege to be part of perpetuating that vision. You can invest in the next generation of Christian Scientists by making a gift to the Bridges to the Future Campaign.